Sub freezing temperatures and a shift in wind greets me as I open my door in the morning darkness. I’m still reeling through yesterday’s events, as I wonder what I’m going to tell my clients on this peachy Saturday morning. “You should’ve been here yesterday.” Perhaps the most infamous and hated line in all of fishing. To me it’s a copout; the fish bit well yesterday so we’re not going to try hard today since conditions are tough. Mother nature can throw a mean curve ball, but if there’s one thing I’ve learned from Mr. Rollins, it’s that the fish are almost always biting somewhere. This whole week has been a series of curveballs good enough to nominate Mrs. Nature for the Cy Young award, with high winds and an onslaught of cold weather dominating the forecast. February fishing in a nutshell. Oh well, nobody is paying us to make excuses. Waiting for both the sun to rise and my customers to show up, I play through yesterday’s events one more time. We’re shaking hands at the boat ramp, as I announce my prediction. “Guys, it’s gonna be a good afternoon. 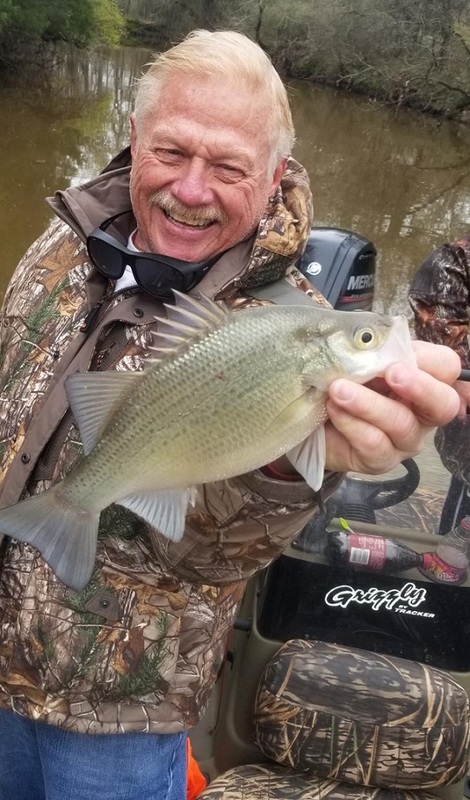 I just heard Vern “The Voice” Osden on the radio for the first time since I can’t remember when.” Sharing a laugh and a couple of quick fishing stories, we get ourselves into the boat, and proceed onto the water. I’m glad everyone is in good spirits, because truth be told, I’m not. 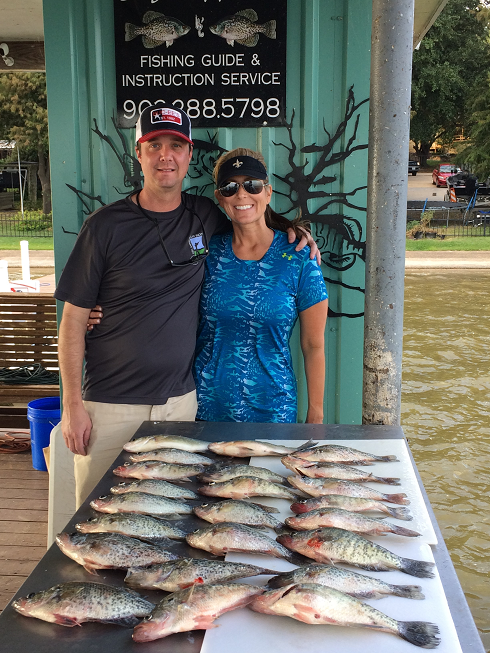 Don’t get me wrong, I’m excited to be on the water, but I’ve been anxious all week knowing that I have time-hardened crappie fishermen getting on the boat today, and I refuse to tarnish the BigCrappie.com name that our team has worked so hard to preserve. It’s one o’clock now, giving us roughly five hours to pull my goal of 30 fish, leaving just enough twilight to clean fish and take pictures. I couldn’t have hand picked a better team to come to battle with me on this brisk afternoon. Matt, Dale, Bobby and John have all brought a trait with them that will help make this team a force to be reckoned with. Dale, an optimistic man at heart, doesn’t seem the type to let life kick him around much. Bobby is good for keeping the mood light, which is the perfect medicine for a tough day on the water. John is consistent and focused, a perfect customer. 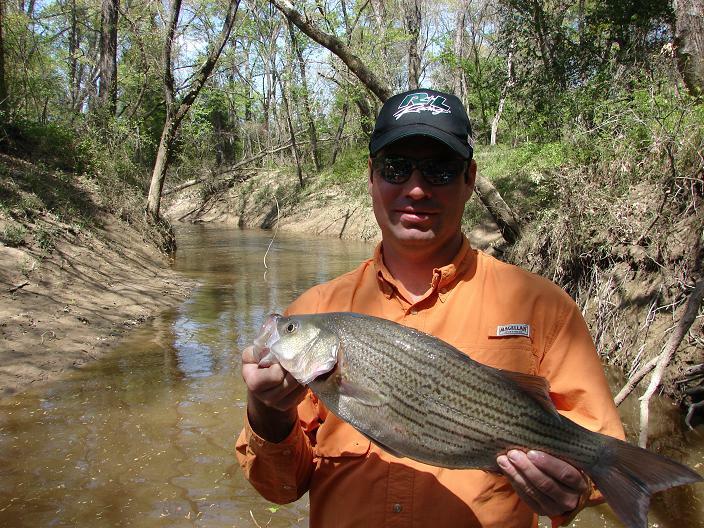 Matt Scotch, spry at heart and one heck of an angler. Me? Well, that depends on who you ask. We’re locked and loaded with graphite and lead as I tell the guys to “fire when ready.” Dropping our jigs down to 19 feet, we await the highly sought after thump that has driven us to madness for so many years. 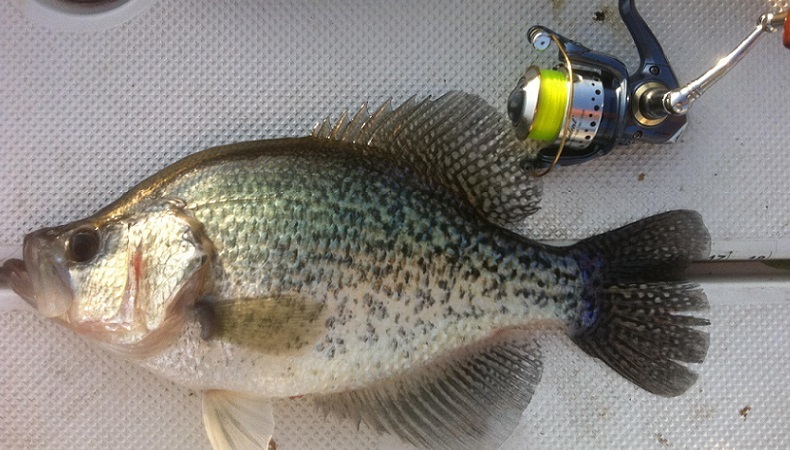 I get tagged much quicker than expected, and pull up a healthy eleven inch white crappie. Two or three more fish are pulled up in the next few minutes, and I’m starting to feel a little easier about today. After a few minutes of fishing, with no more catching, we’re off to the next spot. We hone in on several other pieces of structure that are close to this area, ranging our depth from 16 to 22 feet. There’s never any hard and fast action, but we’re on a clip to get seven to eight fish an hour, and after five hours, well, that’s a decent mess. 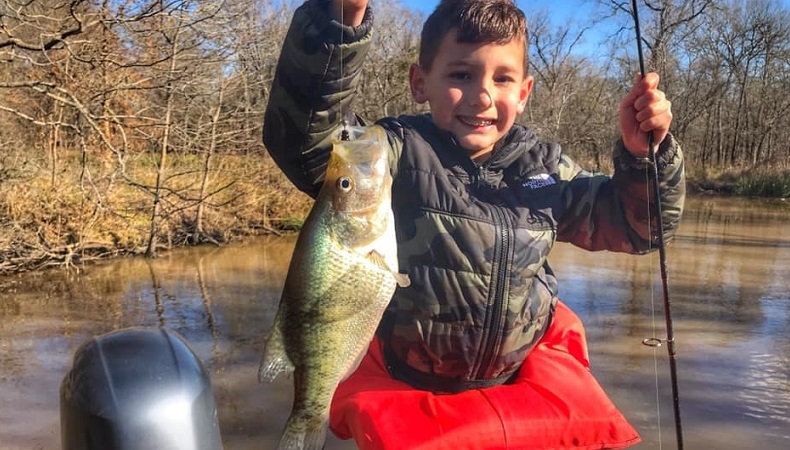 When fishing is fishing, the angler must stay extremely focused at every moment, and they must do their best to make every bite count. There’s just not enough opportunities to go about making mistakes right now. Fortunately, these fish are getting very hormonal and are beating the brakes off the jig once they decide to go after it. 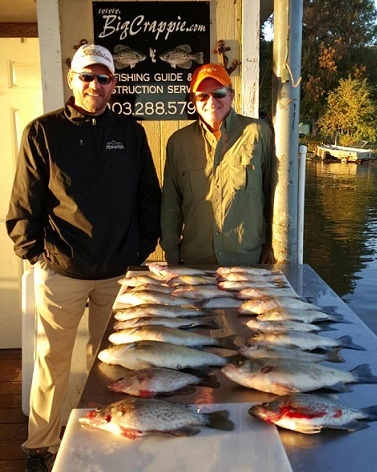 After picking up the aggressive fish from a handful of spots, the increasing wind sends us north to get a reprieve and to help the guide sit on the pile a little better. Idling north, taking our time to enjoy each other’s company, I notice everyone is still seemingly happy to be here. 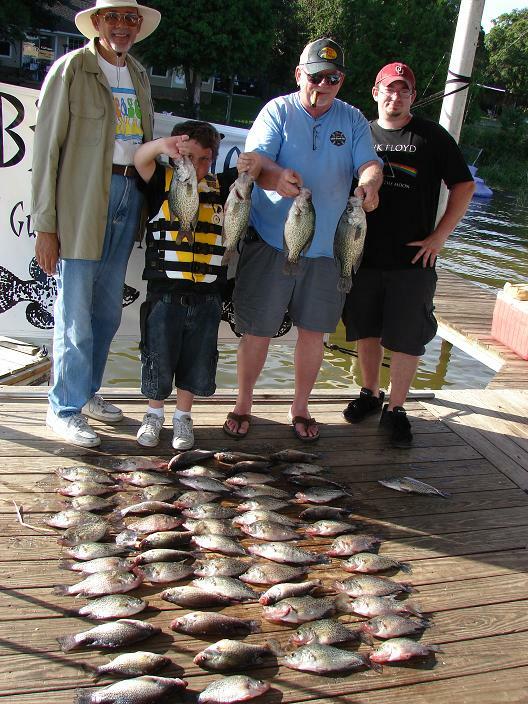 They are all fishing hard, and that’s really all a guide can ask for. What we don’t have in quantity, we are making up for in quality, as we already have some two pound fish in our box. We nestle over a spot in 12 feet of water and again drop our lines. This spot is actually producing fairly nicely, as we land six very healthy fish, in a very quick manner. My favorite part about this time of year is watching the males turn to jet black, as they put on their spawning war paint. 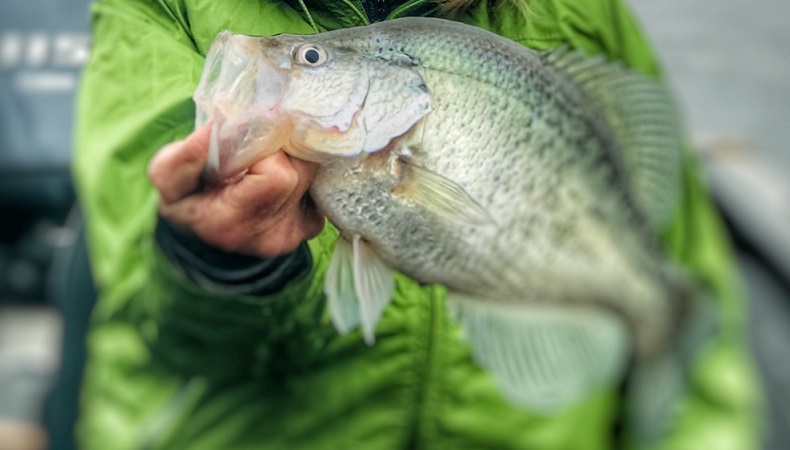 There is nothing more beautiful in the world of freshwater fishing as the snakeskin patterns that are so vibrantly displayed on a large male white crappie. A few minutes go by, and I glance over at Matt who has just frustratingly announced that he is hung up. He’s continues to pop his rod as I keep my eyes on the fish finder, in order to hold us on the danger zone. 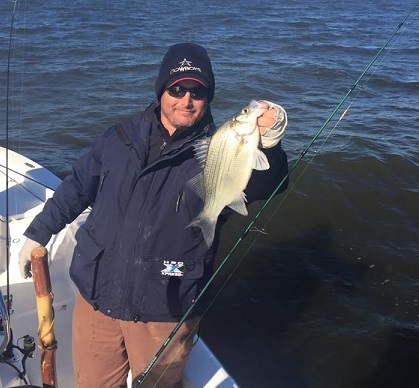 A few seconds pass, and Matt again raises his voice, only this time to holler “Net!” Swiveling around on my bow seat and grabbing the net, which is directly behind me off my left hip, I quickly get to the side of the boat. Emphasis on quickly. Looking over the side of the boat, I see something that closely resembles a large mouth bred with a toaster oven. I can see that we have a big fish on our hands, and I can see that she’s hooked well. The fish swims completely by me as it makes a short run, the shoulders gleaning in the water, spots and all. Matt backhands the fish and perfectly directs the fish back to me, as I make an osprey style jab and watch the fish go in the net head first. The next couple of minutes is basically a high five soup kitchen, as Matt has just landed his personal best black crappie. I guess the fish to be around two and a half pounds, as she is exactly sixteen inches long. Normally, a fish of this stature is photographed and released, so that we can maintain our brood stock here on Cedar Creek. Fortunately, as fate would have it, we only had about fifteen fish in the box after almost three hours of fishing, so I opted to keep this one. After the excitement died down, we went back to fishing as usual. I felt a sigh of relief as I now at least had one happy customer, regardless of what happens the rest of the day. Time to work on the other three. The next two hours goes like this: If we find structure, any structure at all, we fish it, and at best pull two fish. I’m working my tail off, and so are my friends. I can’t thank them enough because I know they our freezing from head to toe, and the bites come few and far between. We’re getting there though, and I can tell by the cooler that we should be really, really close to an even thirty fish that I had hoped for. With daylight dwindling, I give the call that the next keeper wins it. A few minutes pass, and Matt loses a fish accidentally. I can’t blame him, I never want to go home either. 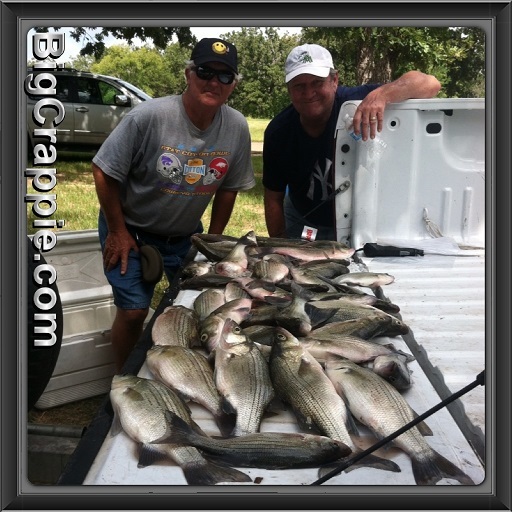 Dale picks up the last keeper, and I tip my hats to the four guys for their hard work and good attitudes. I would like to contact the phone company to see what the record number of text and phone calls is for a five minute time span, because I bet we broke it. 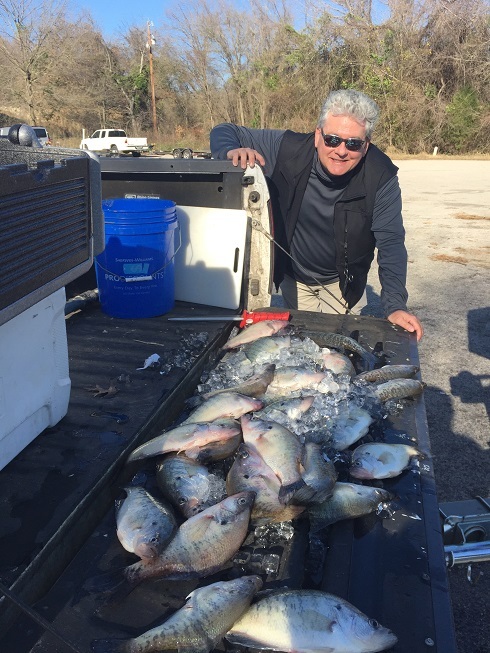 Greg, our newest member of the BigCrappie team, has Matt follow him to Chuck’s house, where they are to fill out the paper work for the record. Interestingly enough, through a little tender loving care, they are also able to resuscitate the beautiful fish in a horse trough rigged with a water pump. The rest of the night is a blur of phone calls, laughing and flashbacks of the days events. 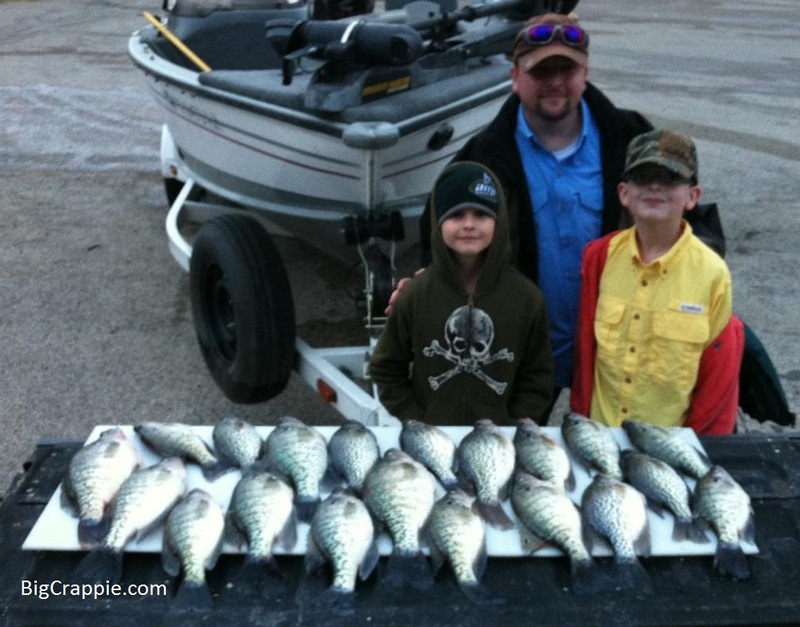 Went out on a crappie trip and had a great time. My friend fishes very little and I was worried he wouldn't be able to catch anything. They walked him through the moves and coached him along the way.